The Revd Ben Inman Rylands. 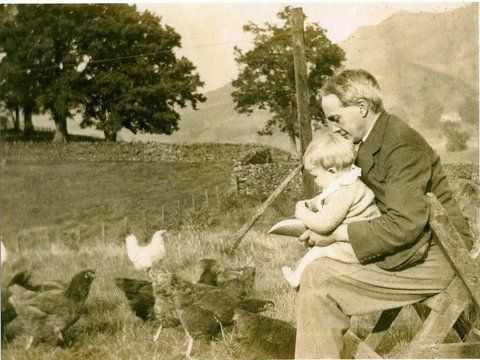 Following our appeal on this website for photos of the Revd Ben Inman Rylands, a former vicar of St John’s-in-the-Vale from 1915 to 1948, a period of 33 years, we are delighted to report that three photographs of him have been sent by relatives: a daughter-in-law, Shelagh Rylands, the wife of Hilary Rylands, one of Ben Inman’s sons has sent two - one shows him as a young man with his first wife, a second taken when he was much older, and from a wedding photograph. The Rev. Ben Rylands as a young man with Marjorie his first wife. Shelagh Rylands, his daughter in law (nee Morton) formerly lived in Keswick on Chestnut Hill. She was the daughter of Colonel and Mrs Morton. She now lives in Aldeburgh, Suffolk. Ben Ryland’s first wife died of cancer. They had four sons, Hilary, Christopher, Martin and Philip (all now deceased) and a daughter, Mary. Val was the son of Ben and his second wife, Margaret. This photo has been sent by his son Val (by his second wife) and dates from 1930. This shows Ben Rylands in his middle age, seated in the vicarage garden with Val, his one year old son on his knee. It seems he was called always called Ben rather than Benjamin; he appears as Ben in the register of Births. 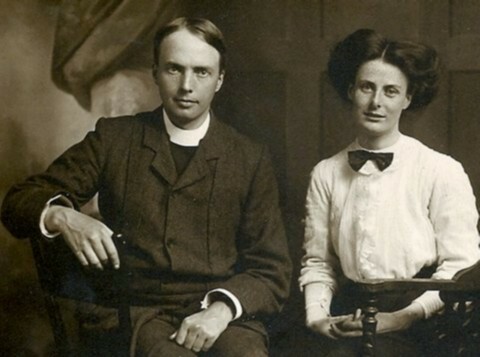 In 1910 he had married Marjorie Ruth Slade in Knaresborough, and during their time in Windermere, the births of their first two children are recorded in the Register of the Kendal District, Christopher I. Rylands in 1912, and Martin W. S. Rylands, in 1914. Ben was appointed vicar of St John’s-in-the-Vale in 1915.The population was then given as 620 people, and the gross income of the living as £420. This was shortly after the outbreak of the First World War, and several of his parishioners had already been called to serve in the forces, and some had died in battle by the time he took up his new job. Mrs Rylands and I have not yet been able to meet you personally as we should like to do, but as soon as the Vicarage is set in order, we hope to come round to each house in the Parish. I cannot help feeling that I shall find the utmost goodwill amongst you, and hope to deserve it……..We are indebted to Canon Rawnsley (Rural Dean), Mr Pearson and Mr Fleming (Churchwardens) for the management of the Parish during the vacancy, and to Mr Parminter (Previous Vicar) for his continued interest in it. There was a large congregation of sympathisers with Mr and Mrs Robinson of Bridge End and their family at the Memorial Service on Sunday evening, September 5th, for Oliver Robinson, who gave his life for his country in the Dardanelles; Harry Robinson and John Easton are reported wounded and we wish them a speedy recovery and return home. In the sorrows caused by the War, all are joined in sympathy; there are few families who have not suffered. I ask you to unite with me in prayer for our Parish, our Church, and our Country. From 1916-1917 was served as a Chaplain to the Territorial Army. During their early years in the vicarage Ben and Marjorie had a further four children, two girls, Margaret R. Rylands in 1916 and Mary C. Rylands in 1918. Two boys followed in 1920, Hilary E. Rylands and in 1922, Philip S. Rylands. But only two years later, at the early age of 33, Marjorie’s death is recorded in the Knaresborough Register of deaths. We can only imagine the extent of Ben’s grief at this great loss. His grand-daughter, Michelle Keane, has said that Marjorie died of cancer, and that she was nursed by a friend who subsequently became Ben’s second wife, Margaret W. Sykes. Their marriage took place in the New Forest in 1927. By now Ben was 48; Margaret was 30. The birth of a son, Richard V. H. Rylands is recorded at the Cockermouth Register Office in 1928. Ben Rylands resigned as vicar in 1948. His death in the last quarter of 1952 is recorded by the Eton District Register Office, aged 73.